Gear drive can be mounted from either side (works for both right-handed and left-handed). 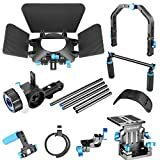 Here is the complete system for the DSLR or video camera owner, consisting of: Shoulder Mount, Follow Focus, Matte Box ,C-shaped bracket and Top Handle. The aim of this kit is to provide the operator maximum flexibility while shooting both outdoors and indoors. It is a very portable and handy kit. Handgrips and shoulder with pad provide comfortable long period shooting. 1/4″ female adapter at bottom Lens Max support up to 77mm. Made of durable anodized black metal and ABS. Compatible with all DSLR cameras, DV. Compatible with industry standard 15 mm Rods. 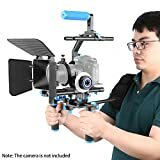 Neewer® Professional DSLR Rig Set Movie Kit Film Making System, include Follow Focus;Matte Box;Shoulder Mount;C-shaped Bracket and Top Handle for All DSLR Cameras and Video Camcorders, Gear Nylon and ABS Dial Index Adjustment: 360degree^Gear drive can be mounted from either side (works for both right-handed and left-handed).^1/4″ female adapter at bottom Lens Max support up to 77mm.^Compatible with all DSLR cameras, DV;Ideal for making video with movable scene or micro shoots.^Compatible with industry standard 15 mm Rods.